How can we create a butterfly garden at our childcare center? Butterflies are the elegant result of a fascinating life cycle beginning with eggs laid by an adult female butterfly on a host plant. These eggs hatch, develop into caterpillar larvae, form chrysalises, and emerge as adult butterflies – and the cycle starts over again. Butterflies can inspire natural learning across the curriculum of science, math, art, dramatic play, and language arts. Childcare center butterfly gardens can be created to support the complete butterfly lifecycle. 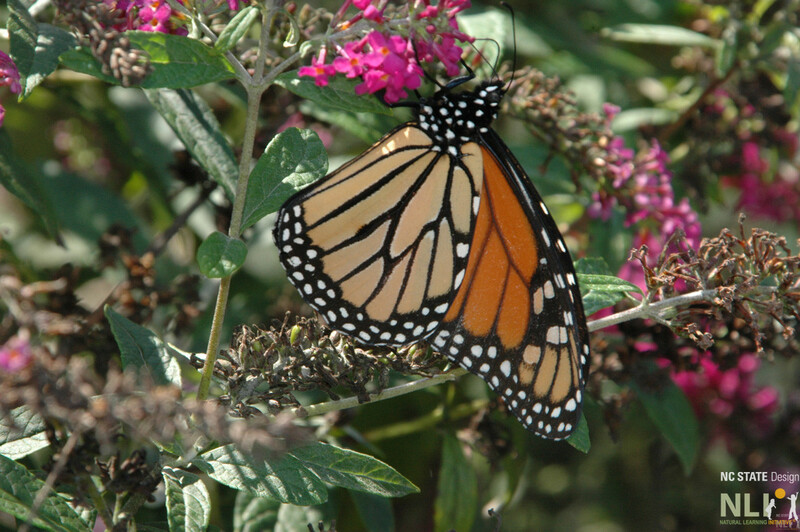 To thrive, butterflies require both nectar-producing and host plants. A successful butterfly garden should contain both. Nectar-producing plants provide a source of food for adult butterflies attracted by brightly colored, sweet-smelling, easily accessible flowers. 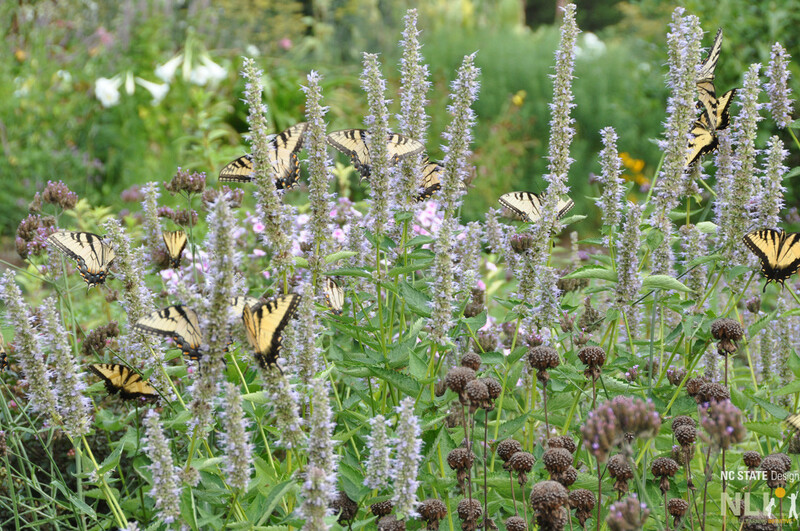 Common nectar plants include flowering dogwood, Virginia sweetspire, abelia, thornless blackberry, highbush and lowbush blueberry, butterfly bush, black-eyed Susan, purple coneflower, lavender, agastache, salvia, cosmos, zinnia, Joe-Pye weed, and asters. Host plants upon which butterfly larvae feed are certain types of native wildflowers, shrubs, and trees. Primary examples include many asters, yellow, sweet and river birch, highbush and lowbush blueberry, clover, dill, flowering dogwood, hackberry, fennel, parsley, passion flower, swamp sunflower, switchgrass, vetch, black willow, and many species of oak. Choose a sunny, sheltered butterfly garden location. Plants and butterflies need sun to thrive. If possible locate the butterfly garden on the south side of a building, wall, shrubs or trees to shelter it from wind that may blow tall plants over. Never use pesticides to eliminate “harmful” insects as butterflies and their caterpillar larvae will also be killed. Butterflies are attracted to masses of color and fragrance, so cluster plants of the same species instead of scattering single plants. A variety of plants that bloom at different times will attract a diversity of butterfly species from early spring through late fall. To attract some species of butterflies, you must plant their preferred nectar-producing and host plants. Review the resources below for specific guidance. Monarch butterfly on butterfly bush (Buddleja davidii). Photo courtesy of Dr. Dennis Werner. Tiger swallowtail butterflies on Agatache ‘Blue Fortune’. Photo courtesy of Dr. Dennis Werner. 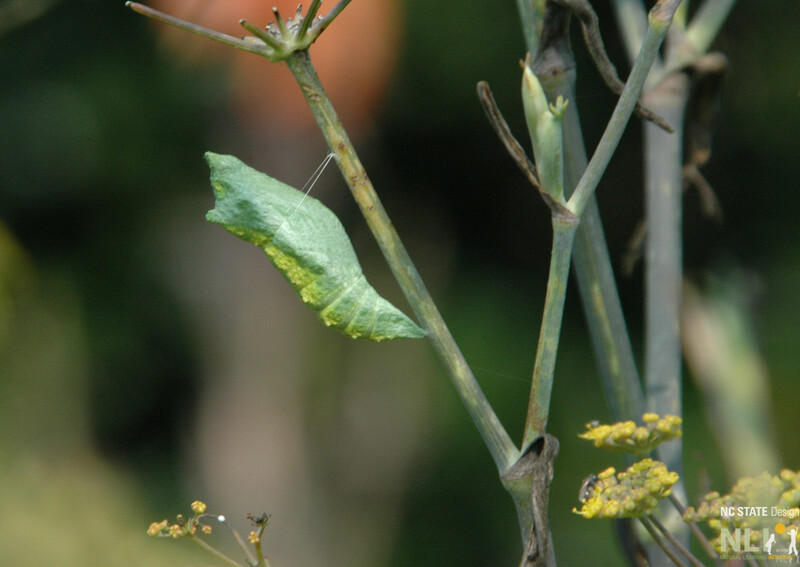 Black swallowtail chrysalis on fennel (Foeniculum vulgare). Photo courtesy of Dr. Dennis Werner. 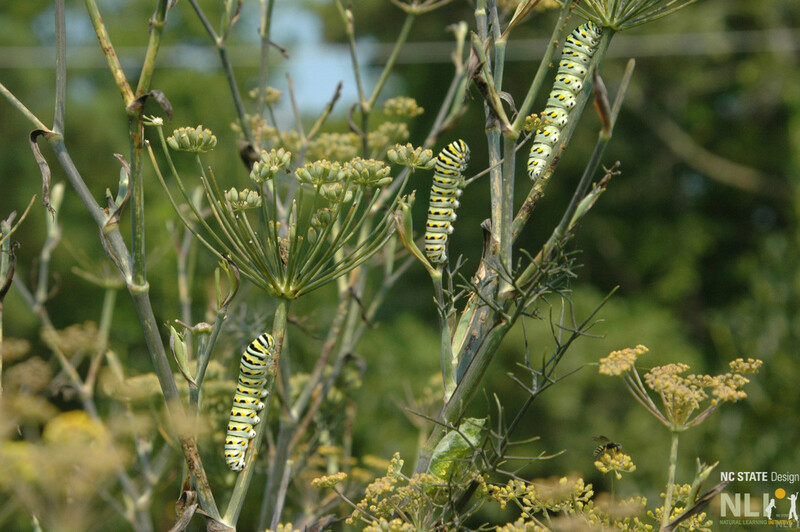 Black swallowtail larvae on fennel (Foeniculum vulgare). Photo courtesy of Dr. Dennis Werner.